In this week’s episode, I am doing something a little bit different. I typically bring you simple, actionable tips in order to help you DIY your Pinterest but this week, I am talking with one of my Simple Pin team members about her role here at Simple Pin. I’ve began building a team during the early days of my business, and it continues to grow as my business grows. I recently created a new Team Educator position. There is so much new information coming out almost every single day about the Pinterest platform that it was just too much for me to keep up with as I work to fulfill my duties as the owner of this business. Steph is a mother of 5 whose kids are getting big enough for Mom to work, but who still need her to be available. A regular 9 to 5 job wasn’t going to work for her. Steph and I met at Starbucks to chat and I hired her as one of my account specialists (I’ve mentioned before that when I started Simple Pin, I made the decision to only hire locally so that I could meet with my team face-to-face on a regular basis.). After being a stay-at-home, homeschooling Mom for many years, Steph wasn’t confident in her abilities at first. It took some time for her to feel confident in her work. I find that for many of my team members, it takes a little while to make the complete shift from Pinterest user to Pinterest marketer. Fast forward three years, Steph has taken on several new roles here at Simple Pin. Steph had started heading up our client care efforts, but it became clear that our account specialists needed to be doing the client care with added support from Steph. Client care is one of the core values of my business. It’s literally what it sounds like. We take care of our clients by keeping track of any big events coming up for them, sending holiday gifts, keeping lines of communication open when there’s an issue with their account, and presenting ideas for changes that need to be made. She then moved into the role of team administrator. When wearing this hat, she basically takes care of all the random tasks that fall outside the duties of the other team members. This includes tasks such as: making templates, drafting documents, and crafting emails. Since Pinterest began putting out so much more information than they used to through blog posts, Facebook lives, etc. I simply couldn’t keep up. And since knowing the latest information about Pinterest is my business, I had to get a handle on it. That’s when I asked Steph to take on the role of educator in order to keep my team as up to date as possible. Each week, Steph compiles a report on the latest information and sends that report to the individual team leads who then email that report to the account specialists on their team. Sometimes this information is about what’s trending on Pinterest for the season, sometimes it’s a report that Pinterest has published. For example, they recently published a report on millennials and Pinterest so Steph shared that with our account managers. Steph’s job is to make sure that all of the team members at Simple Pin have current and accurate information. The most important factor Steph considers when sharing these reports with our team is how current the information is. Pinterest changes quickly and, believe it or not, information from 4 months ago may be completely inaccurate today. Even though information is being disseminated from Pinterest more quickly in recent months, there are still weeks that go by with no new information. If Pinterest doesn’t release any new information, what does Steph research and what does she share with the teams? Steph actually keeps a running list of questions that people ask so that she always has topics to research. She pulls these questions from the Simple Pin Facebook group and from the account specialists themselves. For example, she recently completed a deep dive on the mindset of bloggers who are using Pinterest for their marketing. Steph began to compile her reports, but in the meantime, Pinterest was releasing new information. So Steph broke up her report into a series which she spread out to include the new information that Pinterest was releasing. Steph saves articles until she has enough to share or until she has researched the topic thoroughly. She uses Google at times to research a topic but always makes sure to check the date the article was shared so that the information is both current and accurate (I interviewed Amy Lynn Andrews in a previous podcast episode where she talked about using Google for research so be sure to check that out if you missed it). One of the things that I do to make Steph’s job easier (and actually more complicated at the same time!) is to purchase Pinterest courses for her to take. She goes through the courses and extracts any helpful tips that our account specialists could use when serving their accounts. You can imagine that Steph sees the good, the bad, and the ridiculous. Some courses are so far off of what Pinterest themselves recommend that it is comical, while others have some nuggets that make things easier and get great results. One of the biggest takeaways for Steph has been that we can all learn new things. Nobody has it all figured out when it comes to Pinterest or to any online platform. Even when Steph goes through a course and disagrees with the majority of what the person teaches, there is often a small nugget in there that is new and helpful. She’s learned to never discount someone just because they don’t teach 100% what we do here at Simple Pin. 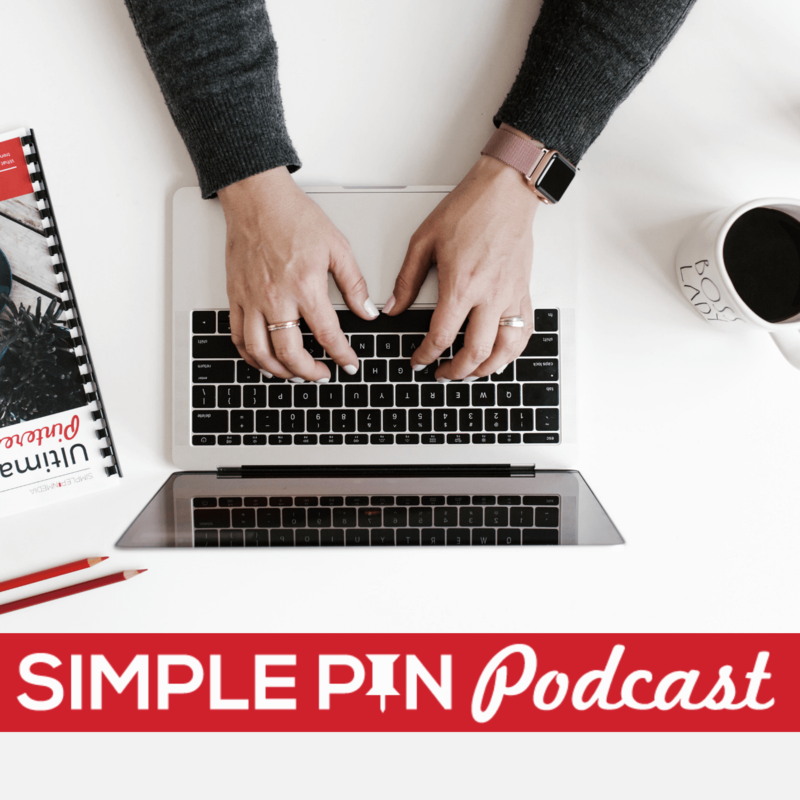 I offered a master course here at Simple Pin for a long time, but I recently discontinued it because of the massive amount of work that was required to keep it updated. I do endorse the course Pinning Perfect because it is always updated! Also, the course creator works with Pinterest, so I know the information is always current and accurate. It’s the first course I took and the only one I endorse. If you are looking for the best Pinterest course to take, be sure to check it out. If you are interested in growing your own social media management business, visit Simple Pin Media to find out all about how I can help you! Kate, I loved this podcast and I will definitely listen to it again. It was fascinating to get a glimpse into your team structure. It would be interesting to “meet” other members of your team too and hear about their differing roles. Great episode…Steph mentioned a website used for purchasing gifts. I didn’t see the link in the show notes. It was something like fair wind trades? We are glad you enjoyed the episode. Yes, Fair Trade Winds is the company we have purchased many gifts through. They are a terrific organization! https://www.fairtradewinds.net/ Thanks for asking!